How serious are the Dodgers about Yoan Moncada? LOS ANGELES -- The most exciting Dodgers-related news lately are the multiple reports that the team had a private workout for Cuban second baseman Yoan Moncada on Monday, one attended by both president of baseball operations Andrew Friedman and manager Don Mattingly, according to MLB. A look at the five most important questions heading into the National League Championship Series. 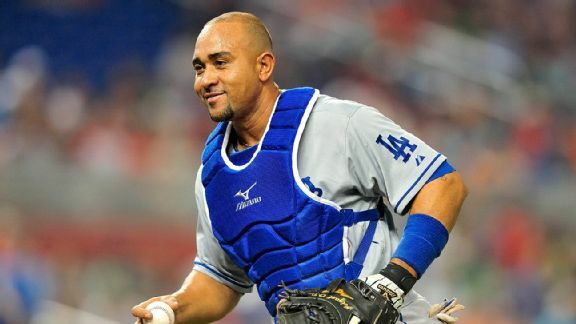 The Los Angeles Dodgers released catcher Miguel Olivo on Thursday, two days after a dugout altercation in which Olivo bit off part of teammate Alex Guerrero's ear during a Triple-A game. RISING Adrian Gonzalez, 1B: He has been uncharacteristically streaky this season, but the upshot has been his usual elite production. Through May 17, Gonzalez had hit two extra-base hits this month. Miguel Olivo, accused of biting off part of teammate Alex Guerrero's ear in a dugout altercation Tuesday, has been suspended. Juan Uribe's right hamstring strain has sent him to the disabled list for at least the next 15 days. 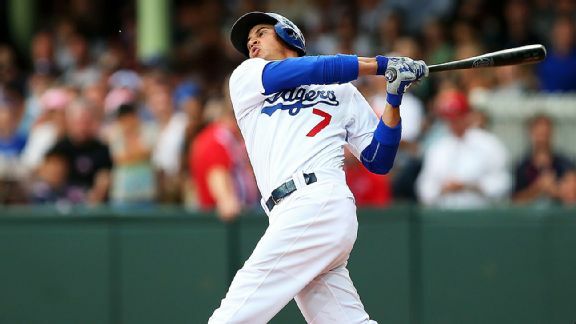 Alex Guerrero, the Cuban infielder the Los Angeles Dodgers gave $28 million this past winter, and Triple-A teammate Miguel Olivo were involved in a dugout altercation during Albuquerque's 7-4 loss to Salt Lake on Tuesday. METS (20-23, fourth place/NL East) vs. LOS ANGELES DODGERS (23-22, third place/NL West)Tuesday: RHP Rafael Montero (0-1, 4.50) vs. RHP Josh Beckett (1-1, 2. The Los Angeles Dodgers activated catcher A.J. Ellis from the 15-day disabled list before their game with the Miami Marlins on Wednesday night.